In a recent interview, Woody Allen, 76 now, said old age does not automatically bestow sageness. He has not met my grandmother. And sageness comes in may ways. I learned about aging beautifully from my grandmother who lived with great serenity through all kind of turmoil by age of 91. A mother of seven, a married women for 40 years with a husband in and out a war, seeing 3 of her children and her husband pass away long before her time, watching over 16 grand children and thirty something great grand children, a quiet belligerent to an authoritarian regime, a literate in an age of girls precluded from school, facing life with great dignity and faith for almost nine decades. My biggest sorrow is missing her last moments on earth. But I know she knew I was there with and for her. As she was always there for me. She was 58 when I was born. She came to visit me upon my birth. I have a feeling I chose my parents because I knew this way I’ll get to have one of most amazing people in my life. One of my dearest memory of her is the smell her home baked bread and pies coming hot out of a brick oven she built herself. Her stories about fidelity and unconditional love for her husband – her parents were against her marriage to the guy as he was a poor orphan. Her stories of war time when she took care of her three young children born before her husband was enrolled into the army. She was wisdom incarnated to me. Her support for all my endeavors was always there. One time she mentioned something about “need to learn to cook for your husband and kids”. My reaction – I was 14 – was something like “I’ll sure cook for my kids. For my husband – let him first deserve it!”. She made no comment whatsoever on the subject in years to come. I am now a cook she is proud of and I cook with pleasure, not out of obligation. She listened with passion about my achievements at school. Her quiet support made me want to achieve more. Before every single school competition she was in my dreams the night before – she would sit on a mountain and I would climb up to her. Needless to say, the second day I would take the first prize. I call it a ‘remote inspirational wisdom’. Her wisdom would make her stay away from disputes or conflicts her grown-up kids were involved in their marriages. She will just be there, for them. She knew nothing about the Convention on the Rights of the Child, but she applied and preached nurturing children in a loved and protected environment all her life – she took her first borns through war. She had basically no wrinkles. With no surgery and not a drop of beauty products on her face. It was her inner world reflected on the outside. Only her hands would betray her age. She embraced her daily life with them and life left small prints on her hands, which stayed beautifully enchanting and calming till her last moments. 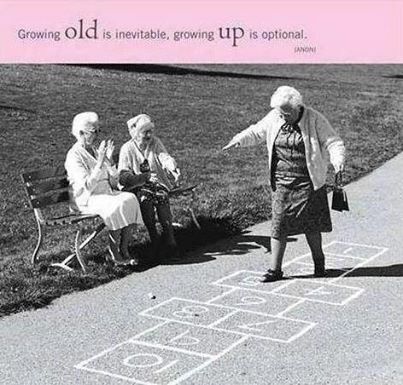 I learned from my grandmother that aging is part of life. It can be ‘golden years’. It can be ‘wasted years’. It can be a ‘great relief’. It can be ‘a great sorrow’. It can be anything we want to make out of it. We have so many opportunities to learn about it before we get to that stage and choose how we want it to be. There are in my life now three dear friends. 55, 62 and 70 years old. Each with great stories and fantastic lessons about aging. I’ll share them with you. Please do share yours. I actually wanted to make a brief comment in order to appreciate you for these nice strategies you are giving out on this site. a whole lot of things.